Although many longtime Samsung users were a little disappointed with the release of the Note 5 and the S6 Edge Plus it appears one group of people is very excited for them. Samsung recently announced their new Test Drive program that allowed iPhone users to try out the new Samsung devices for the low cost of one dollar. 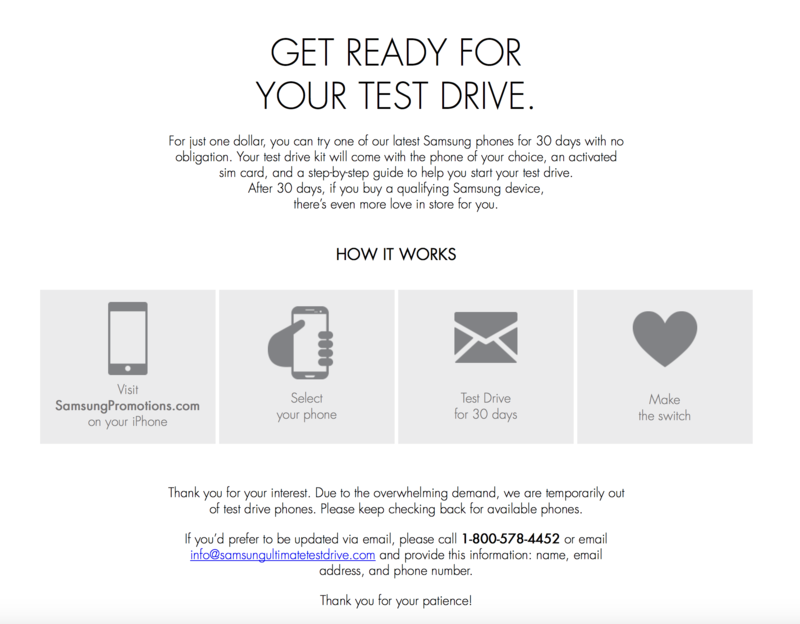 The process works where the iPhone user goes to SamsungPromotions.com from their iPhone, they select the phone model they want and then they Test Drive it for thirty days. Once the thirty days is up you “make the switch” and are sold on the new device. What does this shortage mean? Are Apple fans finally starting to see the light and come over to Android in droves? Or is it just a marketing tactic from Samsung to make it look like more Apple fans are jumping ship then there really are? Or are the Note 5 and the S6 Edge Plus really that good? Although currently out of stock the promotion technically runs until December 31st, so let’s wait and see!